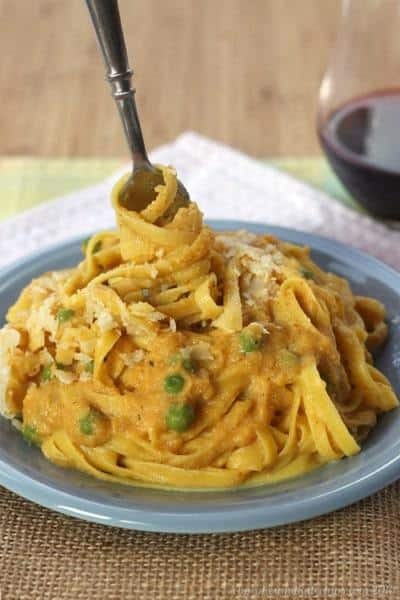 A rich cauliflower cream paired with autumn flavors of pumpkin and sage combine for the most amazing lighter version of the classic fettuccine alfredo. 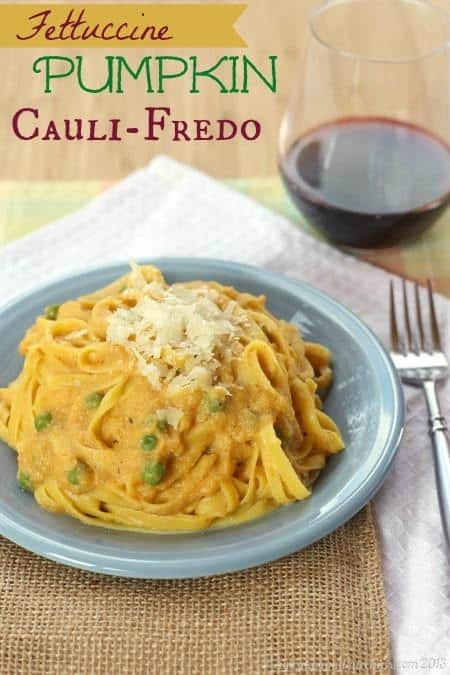 Fettuccine Pumpkin Cauliflower Alfredo is a healthier way to enjoy fettuccine Alfredo! Creamy pumpkin puree and cauliflower come together to create a delicious sauce that may just be one of the best gluten-free pumpkin recipes for dinner this fall! 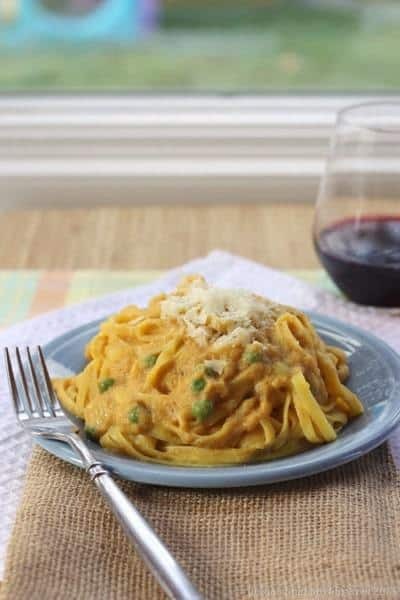 This lighter, autumn version of the Italian classic features what some call the King of Cheeses – Parmigiano-Reggiano – to make a yummy cauli-fredo with pumpkin. Sometimes when I pick him up from preschool, I’ll tell him that we have to go to the grocery store, and the first words out of his mouth are, “So I can get some ‘lellow’ cheese?” And he isn’t talking about buying cheese to bring home. He seems to think that a required part of a trip to the grocery store is a stop at the deli counter for them to give him a slice or two of cheese to eat right now. And when I say “right now”, I mean he polishes it off within fifteen seconds. The kid deconstructs sandwiches to eat the cheese first, and basically scrapes parmesan off the top of his pasta. So obviously this is a frequently used ingredient in our house. And the cheese I chose to feature in my Fettuccine pumpkin cauliflower alfredo recipe? Parm, Parmesan, Parmigiano, Parmigiano-Reggiano. Call it what you want, but my recommendation here – don’t buy the stuff in the canister. My biggest tip for cooking with parmesan is to buy good quality parmesan. I usually pick up one wedge and bring it to the deli counter to have them grate for me, and then I’ll keep another one in my freezer for when I want it freshly grated, or want some shavings or curls. It may cost a little more, but the flavor is so much more intense that you can use less – saving you money and calories. I’ll grate some onto almost any veggie when I am roasting it in the oven, then let it get brown and toasty to add a huge pop of flavor. 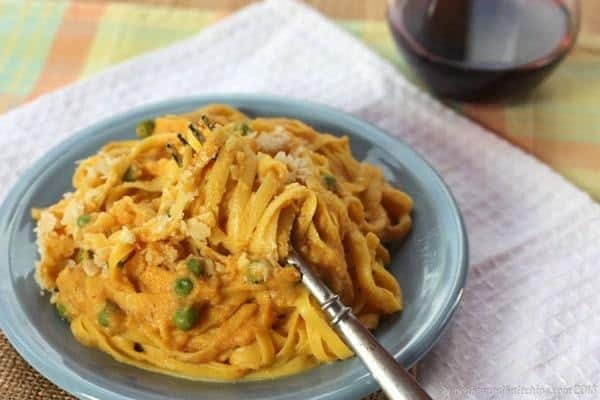 And that flavor truly comes through in this Fettuccine Pumpkin Cauli-Fredo. 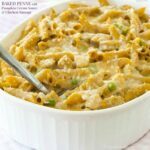 Through my perusing of various blogs, I’d come across recipes for a pumpkin alfredo and a cauliflower cream sauce, so I thought I could combine the two. Totally worked! I did not want to stop eating it. The Bug polished off two plates-full, and brought leftovers for lunch. I may or may not have licked the plate clean from the next day’s photo shoot… at 3:30 in the afternoon. The cauliflower puree, with the addition of the salty and pungent Parmesan, gives the creaminess, and the pumpkin, along with a bit of sage, brings in a lovely seasonal flavor. Nutmeg is commonly used to enhance the flavor of cream sauces, but to also accent the pumpkin, I added pumpkin pie spice. Then I tossed in some peas, mainly for color, so feel free to leave them out if you aren’t a fan. The balance of flavors in the Fettuccine pumpkin cauliflower alfredo is just right. 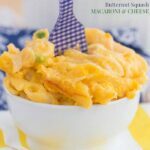 It is rich and creamy, without being heavy like a typical Alfredo sauce. Oh my gosh, I think I may pretend that the bit of sauce left in the fridge is soup, and just eat it with a spoon! 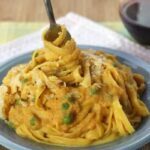 And after you grab the recipe for Fettuccine pumpkin cauli-fredo, make sure you check out all of the other amazing, cheesy recipes at the bottom of this post. American Family Insurance has started the #FamilyDinnerTable campaign to share their the belief that the next generation of dreamers starts at the family dinner table. Follow along as we join with American Family Insurance to share family recipes and stories through Facebook, Pinterest and Twitter, and be sure to follow the AmFam Back to the Family Dinner Table board for meal and recipe inspiration. Combine the cauliflower and broth in a saucepan, cover, bring to a boil and cook for 8-10 minutes, until very tender. Set aside, reserving the cooking liquid. Meanwhile, heat the olive oil in a small pan over medium heat, add the onion, and cook for 5-7 minutes, until soft and translucent. Add the garlic and sage to the onion, cook for another minute or two, until fragrant, and set aside. 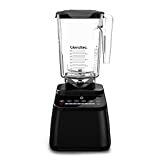 Using a slotted spoon, transfer the cauliflower and 1 cup of the coking liquid to a food processor or blender. Add the onion mixture, pumpkin, parmesan cheese, milk, salt, pepper, and pumpkin pie spice, and puree until smooth. Return the puree to the pot over medium low heat, ad the peas, and heat until warmed, adding additional salt and pepper, if needed. Toss the pasta with the sauce, and serve with additional parmesan cheese, if desired. Hey, there. Just made this up tonight and it was fantastic. Had to let everyone know, it doesn’t just look good. A few modifications and suggestions are indicated on Living Curiously, my blog/site. Suggest more for fall than spring, but we both loved it all the same. A great vegetarian night dinner. Thanks for the creativity! I sometimes eat cauliflower Alfredo like soup. I love it so much! Adding pumpkin is a great idea! Hmm, maybe I’ll thin out the sauce and turn it into a soup recipe! Stopping by from Wake Up Wednesdays. What a great combination! Can’t wait to give this a try. Your pasta looks so delicious! I keep seeing recipes for “Alfredo” sauce using cauliflower, I need to give it a try!!! 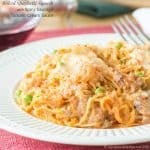 Love this take on alfredo, I love cauliflower in any and all forms! I know! Cauliflower is great on its own and can be transformed in so many ways! Thanks! It does taste and feel like an indulgence! This sounds SO good! 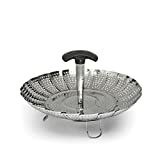 And, I never would have thought to have the deli counter grate the parm wedge. Awesome! Thanks! And yes, much easier than trying to grate it myself, though i do keep a wedge at home too. Look at all that cheesy goodness…made healthier. Love it! This look fabulous!! 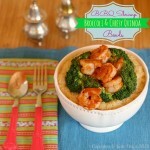 Mmmm I’m going to have try this with the cauliflower cream sauce! And the addition of pumpkin, of course. I love creamy pasta–and boy does this look great! Also, what an awesome tip about having the deli counter grate your cheese for you. How did I not think about that?! It is helpful to have them do it for you. And this was surprisingly creamy! Hmmm…might we switch kids for a day or two? My 5-year-old daughter despises cheese but I sneak it in where I can. I like the inclusion of cauliflower and it looks delicious! Crazy! I can’t imagine a kid who doesn’t like cheese! LOVE this dish! I have seen the cali sauce around a few blogs as well, but wasn’t sure if I wanted to give it a try. Now that you came up with adding a pumpkin twist to it I am totally game. Wonderful recipe!! I love your recent pumpkin conversion, Bobbi! This is amazingly awesome! I used to love fettuccine alfredo until I wised up and realized how heavy and caloric it was, this sounds so much lighter and wayyyyy more flavorful. Plus…who doesn’t love pumpkin this time of year! This cauliflower sauce is a pretty darn good substitute for the rich stuff. Your sauce looks amazing! Love the lightened up alfredo and the tip to use fresh cheese. I agree 100%, it has such a better flavor. Oh, that sounds like a plan…I could definitely eat that sauce with a spoon. Looks amazing! What a glorious pasta! And I love that it’s lighter than a regular, fat laden alfredo…double score! Absolutely, Liz! Regular alfredo always makes me feel too full anyway! This looks incredible Brianne! So creamy and an amazing color too, but not as much guilt as regular alfredo! I loved the color too! Definitely much less guilt, and I know regular alfredo always make me feel too full. Extremely creative! Will make it this coming week, and I cannot wait to taste it! I never had pumpkin and cauliflower together. Very different! Cooked this way, I find the cauliflower gets very neutral and just adds the cream element, with the other flavors starring. My kids are the same way… they still love to go to the deli counter so that they could get the slices of cheese! What an amazing recipe! I love the combination of flavors. I guess I’ll expect many more years of cheese-loving! Thanks Isabel! Cauliflower alfredo has been on my to make list for a while now. Can’t wait to try this one with the added pumpkin goodness. I love how creamy this looks! I also like the addition of cauliflower, I am going to try this for my daughter and get those veggies in there! Are the instructions on how to make it available? Thanks for sharing! So sorry! WordPress glitch. It should be there now. I couldn’t wait for this recipe because I love cauliflower and fettuccini alfredo so much. Combining the two is brilliant! Your son looks to be just about as cute as my great-nephew, Brianne. So great that he goes for cheese rather than begging for a bakery item at the market. Since I rarely buy stuff from the bakery in the market, he does not yet know that is an option 🙂 I’ll keep him on the cheese!